Neelam Meetcha, is an entrepreneur and a renowned expert within the creative gift wrapping and paper craft industry. 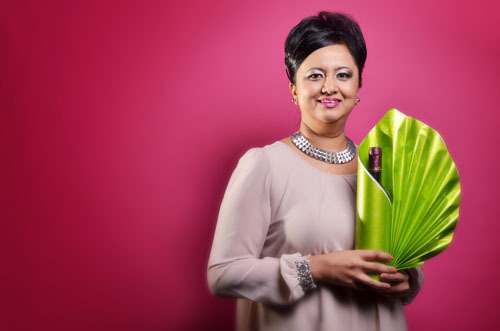 A regular expert presenter on Crafting TV channels across the UK and online Neelam is often referred to as ‘The Royalty of Gift Wrapping’, as she shares her gift wrapping, paper crafting knowledge to thousands of viewers. In addition to her creative gift wrapping and paper craft training academy, Neelam also teaches a broader audience of creative businesses how to build an internet presence by establishing themselves as experts within their field. Neelam loves to share her passion and skills with others and loves meeting her clients who travel from all over the world for her creative classes. Neelam is a sought after creative expert and a regular guest speaker at some of the largest craft fairs in the UK. She’s been featured in a BBC Christmas advert alongside seven-time Grammy Award winner Will.I.Am, teaching him how to gift wrap an awkward shaped present. If Neelam is not filming in her studio or wrapping hundreds of gifts for her corporate clients, she is writing blogs for her followers or teaching the art of gift wrapping and creative paper crafting.